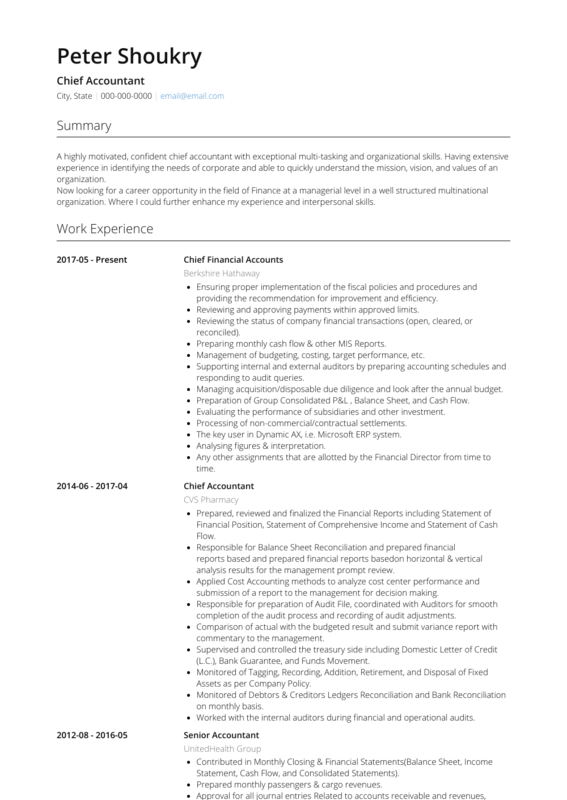 This page provides you with Accountant resume samples that you can use for inspiration in writing your own resume, or for creating one through our easy-to-use resume builder. Below you'll find our how-to section that will guide you through each section of a Accountant resume. Well, I’m not breaking any news to you when I state that your industry is one of the fiercest and most competitive out there, right? If you have landed on this page, you’re most likely looking for some inspiration for the perfect accounting resume sample: well, my friend, look no further as you’ve reached your destination. Not only we will help you building that perfect resume you have been working on for some time now, we will also give you the right tips to land more job interviews and to convince the recruiter that you are the one! We have helped many great accountants like you get to the next level and we want you to be next. Let us inspire you, let’s get started! Most resumes don’t get more attention than 15 seconds: did you know that? Crafting a strong accounting resume is not only important, it is mandatory! Let’s start our analysis from the format: you have quite a few available, although we strongly suggest you use the chronological resume format. You want to get your top achievements at the top, to make sure that the recruiter keeps on scrolling down. Use a friendly yet professional tone, it is way better than a simple (and a bit boring, let us say) fact-to-fact style! We would definitely avoid a funny undertone: professionalism goes a long way! Clear, powerful fonts are a must: especially for accountants like you, basic fonts are your best option as they can be more impressive than one that’s impossible to understand for the recruiter. If you want to use many colors, we suggest a painting class after-work! This is a professional accounting resume and your future employers might think that it is a bit childish to have a rainbow on your resume. Last but not least: did you know that most times Microsoft Word messes up your layout? PDF is the way to go in this case. Do you know that recruiters get an average of 75 accounting resumes per day? Now, based on this stat, do you think they’d appreciate a summary? Of course they would! This is your opportunity to make your pitch, your 60 seconds of fame that will determine whether your resume deserves a second look or not! A perfect summary should be succinct and precise which means short and not vague. It is your pitch to your client: make it count! Use the words “best accountant” more than once. Recruiters who like what they’ve seen so far will give your resume a deeper look: your work history is your chance to get them on the phone to arrange that first interview. What experience you list can get a recruiter interested but also ensure you don’t get forgotten amongst the many other applicants. What should be added? Well, match your experience with the job description and make sure you highlight those qualities they are looking for. Use bullet points and let them know you’ve got the experience to be their accountant for a long, long time. List your accomplishments and best wins, and obviously include numbers and percentages, you are an accountant after all! If you need more tips on writing the best work experience section for a great accountant like you, check out our detailed resume guide. Education is fundamental. As an accountant, please make sure you spend some real time on this as the recruiter will definitely be looking for your knowledge of business accounting and potential certifications. Did you get your CPA exam? Make sure you include that! Simply shows the person you were and are through your education: it shows determination and discipline! Resumes can be a bit sparse when it comes to education but it’s not the worst thing imaginable for a recruiter to spot when looking at a resume. Any educational training you’ve received or undertaken could be added as it will help to make your education look more impressive. This is a very important section for an accountant resume as client’s are searching for specific skills that their hire must have to complete the job. Get that CPA resume out! Don’t add skills not suited to you as an accountant!